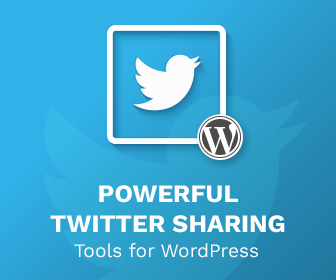 Inline Tweet Sharer Premium is a powerful Twitter Sharing & Analytics Plugin for WordPress. Aimed at bloggers and businesses who wish to control how they share their content, Inline Tweet Sharer Premium takes the hugely popular 1000+ Active Installs, 5* Star Inline Tweet Sharer and gives it powerful addons to allow you to know exactly which content on your site is popular, as well as encourage those who share your content to connect with you further. In Inline Tweet Sharer Premium you can tag individual tweets with various tags. This will allow you to track your campaigns in Google Analytics. Find out which of your tweet links get the most traffic, allowing you to make better decisions going forward in your promotions. Get More Followers with Related Followers Feature! So after somebody shares your tweet, then what? Well in the free version the window simply closes and the user returns to your blog. However in the premium version you can encourage users to follow you after tweeting. This can lead to more followers, and you can assign it to the blog as well as your authors. Installation and setup guide is available on the Inline Tweet Sharer Documentation page.